Invalid Metadata Fix - looking for tracks with invalid(it means, different from online database) metadata. All of them, except Empty Album Name, use fingerprints. 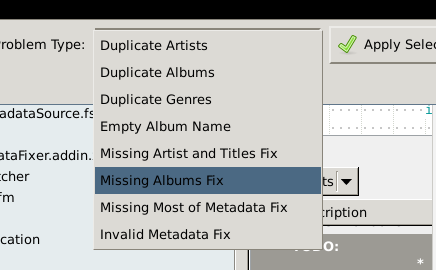 So that's also the difference between Empty Album Name and Missing Album Fix. The first one uses track title and artist name, so you can't use it for looking track with empty albums and/or titles. The second one can be used even for tracks with no metadata, because it takes fingerprints for searching.